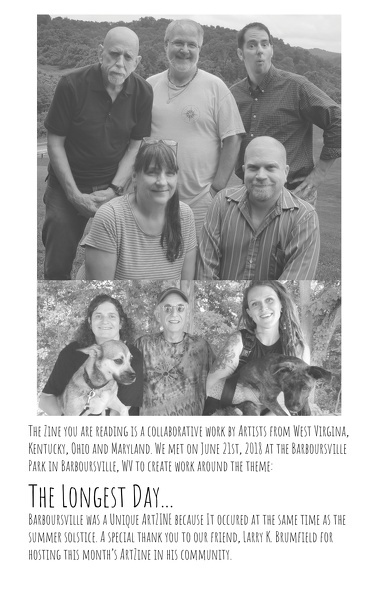 June 21st, 2018 was our 10th monthly artZINE in Barboursville, WV. Our theme was – THE LONGEST DAY. We met outdoor at Barboursville Park, so the weather was not ideal, still we had a good turnout, and a great time. Here are the pages. Click any of the images (or right here) to see/download/print all the pages from the zine (including 10 different hand painted covers). Thanks everyone for participating! July’s artZINE will be in Sandy Hook, KY. We are still waiting to confirm the date and location. Thanks everyone for participating…especially considering the wet weather. and a special thank you to Larry K. Brumfield for hosting this month’s artZINE. You can see/download a copy of the entire artZINE (including the 10 handpainted covers) by clicking here.